The Upper Thames Autumn Head took place last Sunday 28th October 2018 on a cold bright and breezy Henley stretch, the tail wind being strong enough to make conditions uncomfortable for all the crews. Of the 322 crews that raced across both morning and afternoon divisions Henley Rowing Club had 41 crews compete of which 21 recorded 1st places. This was sufficient for the club to take the Victor Ludorum for most successful yet again at this event. 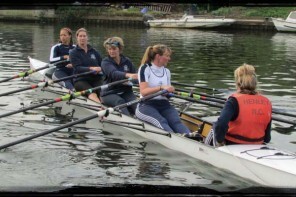 The Henley crews competing covered the whole spectrum of the Clubs membership Senior Men, Senior Women, Masters Men and Women, Junior Boys and Girls of all age groups. 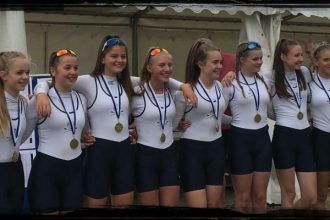 The Junior girls eight of Chloe Beeton, Riley Butcher, Sophie Underwood, Della Luke, Maddy Pollard, Pheobe Snowden, Sophie Hahn, Pheobe Fletcher cox Ella Nolson won Women’s 8s Band 1 in the morning and also recorded the fastest women’s time of the day. The girls J14 squad had a good day taking 1st 2nd and 3rd place in the quads in the morning and a win in the afternoon’s doubles. The girls J15 squad who are just learning to sweep won the Women’s 8s band 2 in the morning. Mia Roullier and Mia Vickerman from the 8o then joining up with Natalie Schoenmakers and Laoise O’Donohue (who had won the WJ15 2x in the morning ) to go and comfortably win WJ15 quads in the afternoon, Charlotte Rolstone coxing. 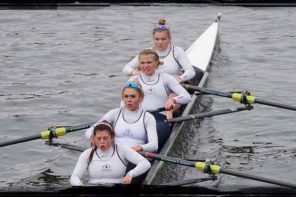 The J16 girls won both the fours and quads events, the quad of Georgie Pollard, Izzy Cotton, Della Luke and Holly Cookson just pipping Marlow RC to take the win. The Junior girls of Holly Nave, Darcy Smith, Gina Segrt, Emilia Fulford Dobson, cox Maddison Sturgess racing in Women’s coxed fours had a good row against some top opposition to take the win. The boy’s squads took wins in J14 Doubles and Quads, J16 Doubles, J18 Quads and Coxless fours. The women took a win in Women’s Doubles. The Masters squad was out in force with a men’s quad competing and four Women’s quads in the CDE category, with the Vet E quad (Knowles) coming a good second place. 14 Medals from 3 Regattas!